Drop-Through Longboards can act as a perfect choice for the relaxed longboarding. The outlook seems to be stylish. It let you and enjoys a free ride like no other type of longboard. You can enjoy with its better stability. You can have a sigh of relief when you see your loved ones riding safely. Drop-Through boards, not to be confused with a double drop deck, you can differ it by having a cutout in the deck, allowing the base plates of the trucks to be mounted through the deck. The lowered platform allows you for greater stability at high level speeds. Greater stability at speed. Lower deck makes foot braking and pushing easier. Lower center of gravity makes slides easier to initiate and control. 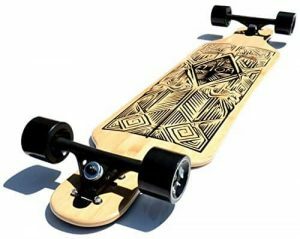 The Yocaher Punked Lowrider Drop down through longboard is a unique longboard in that it combines both the drop down and the drop through mounted deck configurations. More specifically, it is also designed to be able to provide great stability at high speeds. It comes in 29 different designs. This Yocaher longboard showcases 70mm by 52mm wheels with a durometer rating of 78A, HD7 heavy duty trucks, ABEC 7 chrome bearings as well as premium grade Black Widow grip tape. The device is more versatile yet inexpensive while comparing to the other products with same benefits. 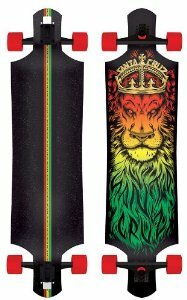 The Santa Cruz Lion God Rasta Drop Thru Cruzer longboard is 40-inch and amazing in its look. Its stability and ease in riding is the main reason behind its quick popularity. You can trust its quality because all the parts utilized in the construction of this longboard are Santa Cruz parts. Very lightweight, easy to store and carry around. Bubbles under the grip tape. It helps you to maximize your surfing experience as it works for long term. 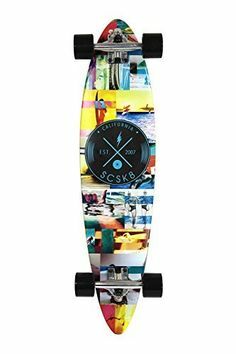 The Sector 9 Blue Wave Lookout drop through Complete Longboard Skateboard, 9.6-Inch x 42.0-Inch has wonderful rigidity and it is suitable for throwing out speed-checks and slides due to its flexing properties. The stability of the board increases by its longer length deck. The board is perfect for cruising around, doing some cross-stepping, sliding and rolling over hilly roads. It works with the great quality and durability. No sharp turning in flatland. This device is completely solid and shows its stability for the ride. 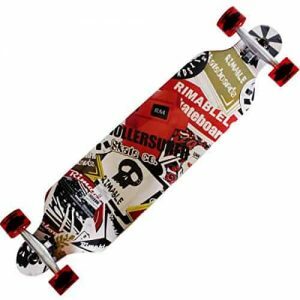 The Rimable Drop-Through longboard (41-inch) has adequate safety and security measures to minimize incidences of accidents. It gives extreme confidence to both freshers and experts. It comes with 70x51mm PU wheels and its construction is 9 ply full maple laminated deck. It is super stable and super fast. Soon the wheels become dirty. When the tracks are adjusted it glides and turns smoother in any surface. The SCSK8 Natural Blank & Stained Assembled Complete Longboard has a number of features that helps to win races. While you are up for a race the 40” X 9” OR 44” X 10” deck size might help you to balance yourself. The 7” Hanger made of Aluminum Alloy shows the durability. Apart from this, the light weight of the board makes it possible for one to stand on it, with ease and ride on it as far as you would want it to go. The light weight enhances comfort feeling while standing and riding on it for hours together. No way to replace wheels. You can get good quality device in low price when compared to the other products. Atom Drop-Through Longboard (41-Inch) is the current favorite board for youngsters. Its Reverse King pin trucks make it extremely stable, particularly at high speed. This board is absolutely perfect for cruising due to its wheels with 41 inches and 70mm. It responds with such ease when you turn. The board offers a bigger size when compared to the normal decks. Smooth ride for the customers who purchase longboard for first time. The above choices have been made based on manufacture, quality of components and value for money and should give great satisfaction to users. Now it’s turn to select the best drop through longboard suitable for you.